This entry was posted on December 3, 2013 by Sports Traveler. The 2013 college football bowl season is almost upon us. Here is a look at our bowl game predictions for all five BCS games this season. Why are the bowl games projected this way? I have made some assumptions of course but I will take the time to explain why I predicted each bowl game this way. First lets start with the BCS Championship. I hate saying a team doesn't have a shot, but barring any injury epidemic, there is no way that Duke beats FSU this weekend. They obviously have a great basketball program over there in Durham and a great season from the football team but they are severely under matched in the ACC Championship. The Seminoles are arguably the most talented team in the FCS and Duke is just a team having a good year. Ohio State is not quite as powerful as Florida State but they have won 24 consecutive games and this team would have been playing the BCS Championship last year if sanctions didn't prevent them from participating in postseason play. The Big 10 Championship should be more competitive than the ACC but I still see a comfortable victory for the Buckeyes. The Spartans don't really have any great wins this season and I'm not confident they can win this either. Thus we have no change atop the BCS Standings. Sure Auburn might still pose a threat with a big win but I don't see the voters giving the Tigers the edge over an undefeated OSU. So the automatic bids that are left belong to Stanford, Oklahoma State, and Auburn. I'm predicting each of these teams will win their respective conference. So based on BCS rules, Stanford will play in the Rose Bowl, Oklahoma State will play in the Fiesta Bowl, and Auburn gets the Sugar Bowl. This of course leaves 5 spots to be assigned. Now we know UCF will get a bid for winning the AAC but the don't have a reserved spot in a specific bowl. 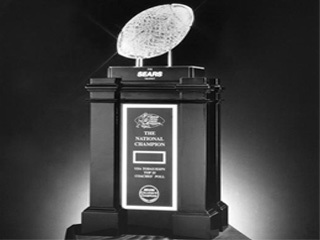 Historically the AAC (formerly the Big East) plays in the Orange Bowl but it is not a guarantee. I have them playing in the Orange Bowl this year for a couple of reasons. First of which is that the Orange Bowl will have first choice of at large teams since FSU will be playing the BCS Championship. The other being tradition. I am assuming that Alabama will hold rank over whoever loses the SEC Championship. If that happens I would have to think the Orange Bowl would pick the Crimson Tide to replace the Seminoles. The Rose Bowl would be next in line to select their replacement for the Buckeyes. It may seem hard to think that Michigan State can lose and make it to the Rose Bowl but this will probably happen. The Rose Bowl has traditionally featured a Big 10 and PAC 12 team so they will always try to keep that match-up if they can. If Baylor wins they will probably be the best option as far as rank but the Spartans will still be eligible. This will give the Rose Bowl the opportunity to keep things within tradition and Baylor still gets rewarded with a trip to the Sugar Bowl. We are then left with the Northern Illinois Huskies. The school is in line for their second consecutive BCS bid. Last year it was the Orange Bowl. This year I'm predicting the Fiesta Bowl. It basically comes down to the Orange Bowl and the Fiesta Bowl. I'm thinking that the committee will try to hold to tradition and keep UCF in the Orange Bowl since they are already losing the ACC. Thus putting the Huskies in the last spot at the Fiesta Bowl. Missouri Tigers - I think they will lose the SEC Championship. They are currently ranked #5 in the BCS and probably won't drop too far with a loss. However they will not make a BCS game because Alabama will get the call before the Tigers do. Alabama Crimson Tide - Alabama will still be the second highest ranked SEC team no matter the outcome on Saturday. Seems kinda wrong but I don't see it happening any other way. This will of course give them a BCS bid without playing in the conference championship. Michigan State Spartans - They are in position to make a BCS game whether they win or lose in the Big 10 Championship. Crazy to think about but that is just the way this system works. Thankfully this is the last and final year of the BCS.